I have always been a fan of the James Bond films, and I really think the franchise hit the nail on the head when they came out with the last couple films, Casino Royale and Quantum of Solace, both starring Daniel Craig as the womanizing spy. 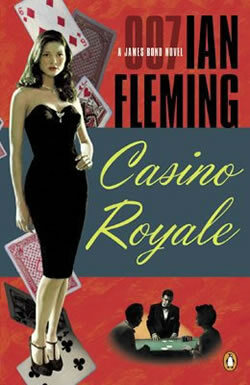 My interest in these movies led me to pick up Casino Royale in paperback, the first Bond novel that Ian Fleming wrote. I’ll warn you now, this review has spoilers. Going into Casino Royale, I knew that I didn’t care for a lot of Ian Fleming’s writing to begin with. I’ve read some of the other Bond books – Diamonds are Forever, Moonraker, and Live and Let Die, and I was not impressed with some of the clunky prose or the outlandish ways Bond gets out of trouble – although that does seem to be his trademark not only in the books, but also in the films (mostly the older films.) I also couldn’t seem to connect to Bond as a character in any of the aforementioned books. That being said, I went into Casino Royale with mid-level expectations, and came out pleasantly surprised. I can’t write a decent review of this book without comparing it to the movie of the same name, only because I have very rarely (if at all if I remember right) come across a movie that did a book justice. This book in particular, Casino Royale, starts off in the Royale-Les-Eaux casino in France, with Bond playing Baccarat against Le Chiffre. It’s interesting because this is where the book starts off, but the movie only reaches this point about half way through. Most of what’s found in the beginning of the movie – Bond’s free running chase through a construction site, his encounter with a bomber intent on destroying the prototype Skyfleet airliner, and his love affair with Solange are never mentioned in the book, but they did add to the movie and actually helped to round Bond’s character out a bit. The book follows the same premise as the movie on the whole: Le Chiffre is thwarted by Bond’s card playing, Vesper is ‘kidnapped’, and Bond gets his manhood smashed into little tiny bloody pieces. Bond falls for Vesper, begins to gain suspicion with her strange moods, and eventually finds out she is a double agent working for the Russians. In the end, she kills herself and Bond is left the cold-hearted spy we all know and love. The book differs slightly in many areas compared to the movie – Bond isn’t run off the road by Vesper’s body laying in the road, instead road tacks are used to incapacitate Bond and his vehicle. Le Chiffre doesn’t torture him in the bowels of a ship, but in a quiet summer home. And the conspiracy surrounding Vesper isn’t necessarily tied to the Bond’s winnings at the Royale, but still follows the familiar path the movie did. It was interesting, after seeing the movie, to pick up on the small variations. Reviewing this as a story disconnected from the movie, I give it four and a half stars out of five. I think I enjoyed this Bond adventure much more than the others that I’ve read because it brought Bond’s humanity to light, I was able to see how he met Felix Leiter from the CIA, and I felt for him when Vesper killed herself at the end and revealed her betrayal to him and the Service. I especially enjoyed the build up towards the end where Bond begins to pick up on hints of Vespers suspicious activity but allows his feelings for her to override his instinct – in turn becoming a regret in the end. The only real complaints I have with this book are the sometimes clunky prose that pops up every now and then, and the french that is poured on thick at times both in dialogue and description – most of which isn’t translated. So there were times I had no idea what Fleming or Bond were trying to tell me. But those weren’t enough to make me not like this book. I may still read more of Fleming’s novels in the future, and I have The Union Trilogy by Raymond Benson on my 2012 Reading List.